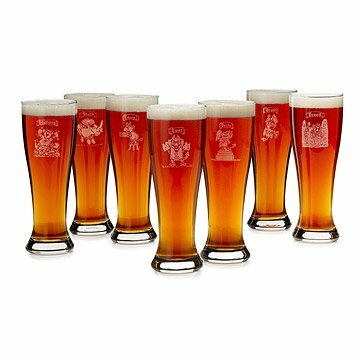 Devilishly fun, this set of seven pilsners glasses is etched with personifications of the Seven Deadly Sins. Raise a toast with these sinfully witty pilsners, each etched with a cartoon personification of one of the Seven Deadly Sins drawn by award-winning cartoonist Mort Gerberg. Historically immortalized by literary giants like Dante and Chaucer, these infamous imps come scrambling out of the underworld as illustrated cautionary tales on the pitfalls of human vice. Gerberg's characters are etched on classic tall pilsners that fit your hand nicely, whether you're lusting after a cold one or indulging in the gluttony of your third. Just remember your sin to keep track of your beer at a party. Glassware made in Shreveport, Louisiana; engraved in Reno, Nevada. Check out our 7 Deadly Sins Old Fashioned Glasses and 7 Deadly Sins Etched Shot Glasses . Copyright (c) 2014 - Seven Deadly Sins Pilsner Glasses - Set of 7 artwork owned by Mort Gerberg and licensed to Uncommon Goods LLC. All rights reserved. I needed to buy some beer glasses and came across these. They are cute & folks can remember their glass! Love these! When entertaining, it really sets the mood and gets things going to ask which deadly sin the guests wasn't for their drinks. I was concerned about the number, but there are always bottle drinkers, non drinkers, &c.
Picked out for husband on fathers day. He's a beer enthusiast and with other enthusiasts in the family, I thought this would be a fun set to have at parties. We do fight over gluttony and sloth! They are very big and that is good but at times they are a but too big. I worry that they will break a lot, especially once the beer in them has been consumed so we don't use them outside. Storing them is also an issue. They don't stack well and they take up a lot of space in the cupboard but as a gift, they were well received! Delivery was quick and satisfactory. Packaging was good. Nice item. Happy with the product. The 7 Deadly Sins beer glasses were a hit with the whole family, which includes a professor of religion and 2 ministers. Will be great for entertaining. The cartoon etchings of the "Seven Deadly Sins" are whimsical and funny. It's a unique set of glasses in a number (7) that isn't typically a set, but still a good number for having friends over for a beer. I was amazed by the customer support. A couple of the glasses arrived broken. I called Uncommongood on Christmas Day and they quickly shipped a complete set and told me to keep the 5 unbroken glasses of the first shipment. The new set arrived a few days later unbroken. My son has 12 glasses instead of 7. The Glasses are a wonderful start to my new collection of glass wear. Loved the 7 deadly sins sketches!